Embroidery is a craft with ancient origins, dating back to early cultures across the globe. By using a needle, thread or yarn is sewn on to a base material or fabric to create a pattern. Today, embroidery continues to be a popular craft and is often featured on clothing and decorative housewares. We offer the highest quality embroidery available on apparel and products. We offer appliqué, 3-D, along with other stitch patterns to achieve the look you’re aiming for. Embroidery is one of our most desired services among corporate and casual organizations. 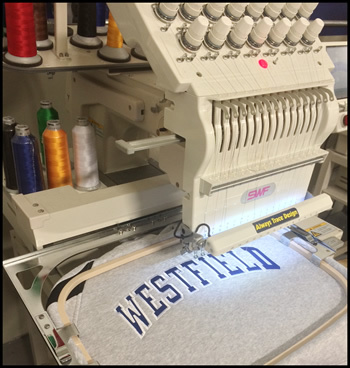 Custom embroidery of your logo can be placed on polo shirts, hats, t-shirts, jackets, uniforms, and other products. We specialize and customize to suit your needs. W e have been embroidering apparel since 2007. This is traditionally an upgrade over screen printing, but is sometimes the more economical option. This is due to the fact that we offer low minimums on items such as polo shirts, t-shirts, sweatshirts, jackets, baseball hats and many other items. We offer expert in-house custom embroidery services. You can be confident that your project will receive personal attention from our dedicated team. Your embroidered, custom logo will ensure your company gets noticed. Embroidery is also the best solution for classic event apparel such as golf tournaments and charity functions. Embroidered logos on apparel increase your campaign’s brand awareness, especially when all participants are wearing the same shirt, hat or other item. When screen printing, letters can be made smaller and colors can be blended more intricately than with embroidery. The advantage of embroidering your logo is the added texture, character, durability and eye-catching appearance! Lettering is the biggest challenge in embroidery. Because we’re using needles and threads, letters must be no smaller than ¼ inch high. In addition, we may need to adjust the font to keep the overall size appropriate for a shirt or other garment. 1) The minimum height of any text should be no less that 1/4″ – any smaller than this and the holes and shapes that make up the letters can start to close making the text look messy or even unreadable. If your logo has text that is smaller than this, don’t panic! Let us have a look and we can generally find a way around it. 2) All embroidered logos are measured in stitches. The bigger and more complex the logo, the longer it takes to digitize and sew. When you request a quote, we will evaluate your logo – absolutely free – to determine what works best for you. 3) To embroider your design we need to digitize it – this basically involves redrawing the design in special software that allows us to plot the position, size and direction of every single stitch. When we digitize your logo we have total control over the finished product. Ready to get a quote? Ready to start your project? Contact us today!